There's a graphic novel anthology called To End All Wars that's worth checking out. Featuring more than 50 contributors from 13 different countries, the book will be a series of graphic narratives on the topic of the First World War. We have a sneak preview of it right here. The anthology is being released in the UK this month and in the US this September. The 27 short graphic narratives are based on actual events, characters, circumstances, incidents, myth, or consequences of the Great War. It covers everything from the first aerial bombing of British civilians to the "live and let live" arrangements between the opposing forces. The anthology features the four theatres of war — land, sea, air, and the home front — while the narratives span four continents and draw from both sides of the conflict. Intrigued, I spoke to the editors about the project, Jonathan Clode and John Stuart Clark. They told me that it was designed as a tribute to those who sacrifice all in the insanity of a preventable war. 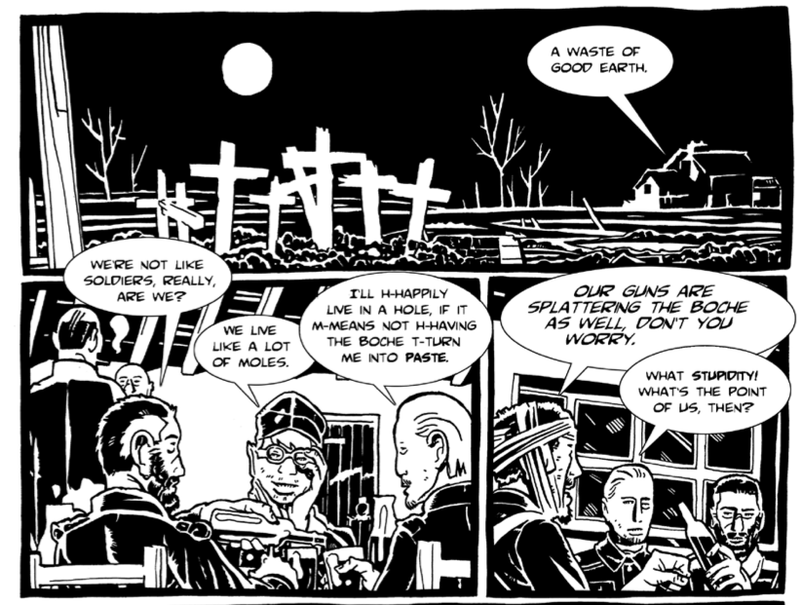 io9: It's hard to believe there aren't more graphic novel interpretations of the Great War. What does this media voice offer to history that others cannot? John Stuart Clark: There is an appreciable body of excellent WWI comics, but not in the English language. Exactly why WWII totally swamped the Great War in the comics media isn't clear, since WWI was not only a critical turning point in the history of war, but is actually far more interesting than WWII in terms of events, characters, incidents, myths, circumstances and consequences. Possibly it is simply a legacy of the dismissive way the war is taught in British and American schools. Jonathan Clode: Be it music, literature or theatre, every medium brings its own unique voice to the story of WWI, but the great thing about comics is that the establishment doesn't take our medium seriously. We are, if you like, the guerillas in the arts, and as such are free to explore stories that present themes and topics that, while based on fact, may be embarrassing and challenging to the status quo. Certainly in To End All Wars we present stories about things the powers that be would rather were lost to history. John Stuart Clark: I'm not sure comics are more accessible or evocative than, say, films, but because our medium is more demanding of the public, graphic literature offers a more intense personal experience. It's a common misunderstanding that comics make reading easier and that the pictures are simply illustrating the text. At their best, a comics panel injects into the reader's mind two counterpointed strands of information that he or she fuses into one in the adjacent gutter, the space between panels, before moving on to the next uptake of information. The interplay between the image and text is what makes the medium both unique and more subtle than the literati appreciate. Given that this medium has been around since at least the Bayeux Tapestry and Alciato's Emblems, I genuinely believe comics creators have barely scratched the surface of what our medium is capable of. io9: What does this particular anthology offer in terms of historical re-interpretation? Stuart Clark: Given that even now, in the centenary year, media types and politicians are still trotting out the same old jingoistic rubbish about a 'just war' against German expansionism, To End All Wars takes as its starting point that the conflict was totally unnecessary, a product of incompetent leadership by a corrupt elite, and without doubt the greatest war crime of the 20th Century. From there our stories mostly focus on the physical and psychological impact of the first industrialized war on combatants and the public. As such we hope it puts a human face on a preventable apocalypse in which ordinary men and women were used as gaming pawns. io9: Which story is the most important or compelling? Jonathan Clode: I don't think any one story is necessarily more important than another. Given that we wanted this book to open people's eyes to aspects of WWI they probably didn't know about, each story fulfils a particular function. The Iron Dice addresses the reason the whole thing started and the political agendas behind it. The Cowards War challenges the long held assumptions about deserters and the toll combat takes on young men. No More Than Cattle and Every Man for Himself step beyond the European theatre and show us the impact WWI had on Africa and the Middle East. Perhaps the most poignant story is our final piece, Memorial to the Mothers. It strips away all of the notions of right, wrong and taking sides and leaves us with the true toll of war which is pain, death and insurmountable loss. Part of the process in crafting these tales was to make sure each one evoked something unique and could stand on its own as a worthwhile statement about the travesty of this terrible war. To End All Wars will appear via Soaring Penguin Press in July 2014 in the UK and September in the USA. £2 ($3.40) from each copy sold will go to Médecins Sans Frontières. All images courtesy Clode/Stuart Clark/Soaring Penguin Press.